Say what you want about Michael Schumacher, but he has had an illustrious and storied racing career that few have matched. To cap it off he's making a run that gives a new meaning to the term "victory lap": a go around the Nürburgring in a Formula One car next month. I'm not talking about the Nürburgring Grand Prix circuit, either. I'm talking about the Nürburgring Nordschleife. You know, the actual 'Ring. He's doing it in a 2011-spec Mercedes Formula One car. Are you starting to picture how insanely awesome this will be? According to Evo, Schumacher, who retired from F1 last year, will run the demo lap on May 19 before the start of the Nürburgring 24 hours, which isn't actually far from his home town of Kerpen. 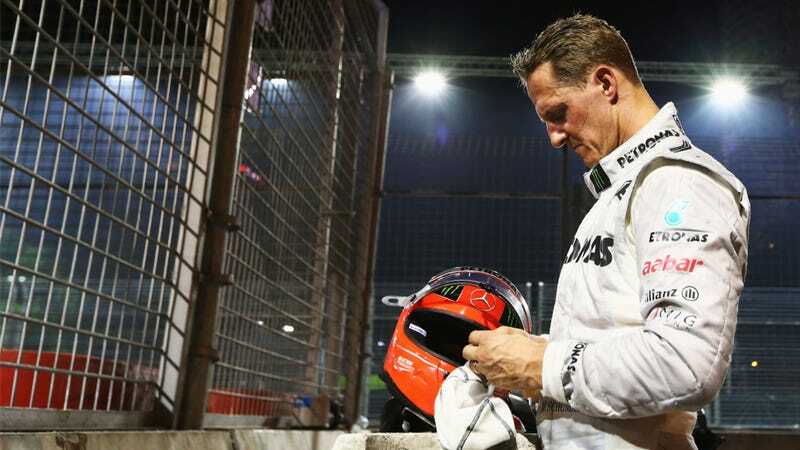 Schumacher will be only the second driver to run a modern F1 car around the Nordschleife since Niki Lauda's famed near-death crash there in 1976, the magazine reports. The first was Nick Heidfeld who did it in a BMW Sauber car in 2007. Here's hoping Schumi will stick a GoPro or two on the car to give us all something to watch and admire later.